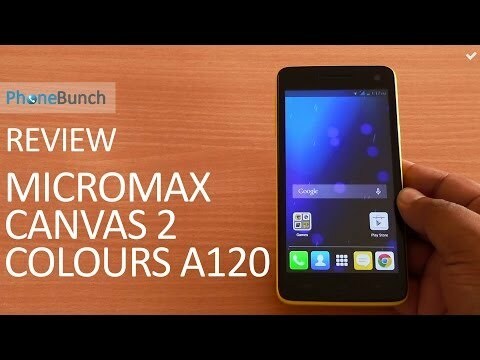 If you own Micromax Canvas 2 Colours A120, please do leave your feedback too. Lowest price of Micromax Canvas 2 Colours A120 price in India starts at Rs. 11,500 Micromax Canvas 2 Colours A120 is available on Amazon at Rs. 11,500. Prices updated on 24th April 2019. Micromax Informatics Limited is one of the leading consumer electronics company in India and claims to be the 10th largest mobile phone player in the world. The Canvas 2 Colours is a dual-SIM phone that is priced around Rs.9000. The phone comes with 1 GB RAM and runs on a 1.3 GHz , MediaTek MT6582 , Quad Core processor. It has a 5 inch display with the resolution of 1280x720 pixels which takes the pixel density to 293 PPI. The phone comes with 4GB internal memory which is expandable upto 32GB. It has a rear camera of 8MP and a front camera of 2MP for video calling and now, selfies. The battery is a removable lithium-ion one with 2000mAh power. One looking to buy this phone can also check out the Asus Zenfone 5 or the Xiaomi Mi3.